"In Kyrgyzstan, corruption is not a problem for the state, it IS the state"
The Kyrgyzstani state should be understood primarily as a market for investing in public offices, claims a Swedish political scientist in a newly published doctoral thesis. Dr. Johan Engvall says ordinary political theory does not even provide us with the tools to understand the Central Asian republic, because in it, corruption is not an external problem but the very method of governance. The full-fledged cooperation between police and organised crime under president Bakiev was a low point, he says, but he isn't too impressed by the the post-Bakiev politicians either. At the same time, this state-for-sale can be changed, he believes, pointing at the Georgian example. - Johan, tell us a little bit about yourself and why you started writing about Kyrgyzstan and corruption? - I started studying Kyrgyzstan I think six years ago. I was fascinated about Central Asia in general and wanted to write a PhD about any country there. I first arrived in Kyrgyzstan simply because I found the best contacts there. I had the idea that what I'd read in the literature, about democracy and authoritarian regimes here, was not enough. I needed to go to the more basic level, to the statecraft, how was the state functioning here, because these countries had not existed as independent states before 1991. 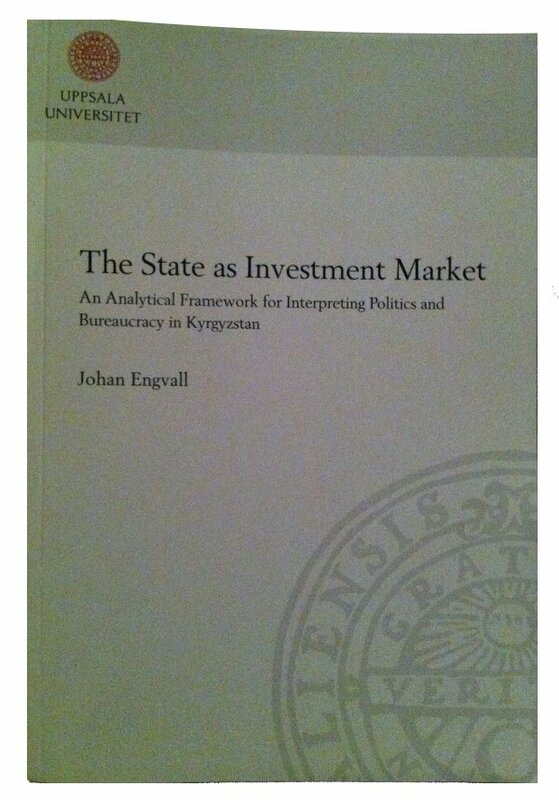 - So what's your 237-page dissertation, The State as Investment Market: An Analytical Framework for Interpreting Politics and Bureaucracy in Kyrgyzstan, about? - Well, I started out influenced by Western theoretical models of the state as something set up for the benefit of its citizens, with officials hired on a meritocratic basis and working according to laws and regulations. But as I visited the region, I realised that this perspective would just enable me to observe the obvious: that it's a weak state. It couldn't describe how the state actually functions or works! So I let people speak freely and didn't apply my thoughts. And people started describing how the system works. And they spoke a lot about the corruption. I realised you can't use the Swedish framework: to look upon corruption as an infringement on the classical state roles of the judiciary, taxation etc. It became very clear that corruption here was inseparable from state institutions. Corruption is also a vague phrase: on one hand its money corruption, which is extremely strong. And on other hand it's the personalistic ties, clan, which has been emphasised a lot in earlier literature. And more and more I realised that even though personalistic ties is important, and kinship and village connections give you a starting point in life, in the end the decisive aspect in this system is the need to pay money for your position: buying the job. - What is new about your conclusions? - Previous research on Kyrgyzstan tends to describe the state as very particularistic, often based on clans and other traditional loyalties. To me it became clear that there was something more to political and administrative appointments in Kyrgyzstan: the main factor was money. So I show Kyrgyzstan to be more modern than how it's normally described. In the beginning I thought this was strange. You know Kyrgyzstan is described as weak state, with no resources, and no high salaries or prestige attached to public offices. But still people were very desperate to get into these public positions — why? Then I realised that if you want to make money, public offices and administrative resources are really the key. Let me give the following illustration: There's been plenty of research on how elite actors compete for control over economic or natural resources of the state after the collapse of communism, that's all true, but the public offices and the state administration is really the key resource needed to make money and that has not been systematically analyzed. You know, the World Bank did a groundbreaking study of how powerful private businesses buy preferential treatment from the state. But the key factor in Kyrgyzstan is to actually become the high level official and then yourself decide whom to treat how. In a sense, in Kyrgyzstan, you cannot even talk about public goods – almost everything becomes private. The term public sector becomes very irrelevant. The main thing is the pyramid structure, with money flowing from the bottom up. There is little separation here between being a politician and being a civil servant. You can have very different returns on different levels, but its an integrated system connected from top to bottom. - Can you give some examples of this corrupt state? - Of course. The police, especially under Bakiev, had very close ties to, if it wasn't the same thing as, organised crime. At least there was cooperation between them for commercial purposes. I made some interviews in Lenin district tax office in Bishkek, and just a few days later two of its officials were murdered in a car, and they turned out to be members of organised crime networks. There are many examples with the special forces, where their employees come from crime groups and also where dismissed former officials go directly to join organised crime groups. And quite often they hold both positions at the same time. This creates lawlessness in the state machinery. As a politician in Kyrgyzstan, you almost need to build up your own state around you: you need to have your own judges, your own police, perhaps your own gangsters. Let's see now what [newly inaugurated president Almaz] Atambayev does. I'd say he's better than Bakiev but probably worse than Akayev and Otunbayeva. His regime will be tempted to return to the power pyramid and strengthen the presidency. But the Kyrgyz are flexible and adapt fast, maybe they can stick to this parliamentary system, which I think is worth trying. - So what's the price list? How much do different state jobs cost? - This is difficult. but in high levels it can be hundreds of thousands of dollars. But the profits can be millions. just look at the ailing electricity system where the main problem is not infrastructure but embezzlement. It's a very distinct career system, like in the police force. Traditional detective work gives no real opportunities for return, and is therefore less attractive. But in the traffic police, there it's mandatory to pay. It's like a commercial organisation or franchise where you also have to pay some money up the linear hierarchy all the time in order to keep your position. This is called a burden, or gruz in Russian. So the price tag depends on the spot, some are more profitable than others. And if you are well-connected, it's cheaper. Maybe for a traffic police job, 5 000 or 10 000 dollars. But the exact nature of this market for public offices is something I would like to find out more about even though it is obviously difficult. It seems as if a lot of this starts already in the education system, where you pay to enter for example the police academy and then you pay to get your grades. So new recruits know the rules from the beginning and it's not strange to them. - If your theory is valid, why does the state work at all? How does a state institution or civil servant balance between doing their formal job and using it for their own personal good? - You can't use everything for your own benefit. There's still an organisation within the state, implicit agreement that you can keep some amount of money, but not everything. You have to show some taxes, and provide some order etc. Still, a striking feature is that there is a private order and service provision within the state framework. Justice and protection and other services are available, but you have to either have contacts or pay for them. This is often seen as not only negative but a quick way to solve problems when formal rules are not enforced. People complain about having to bribe the traffic police, but the same system also means they can pay their way out of a speeding ticket cheaper. - On page 108 you write that public office buying started around 1995, championed perhaps chiefly by the former first lady, Mairam Akaev. You then quote someone saying that "If Akaev began to build this system, Bakiev brought it to automatism." Talk about how this system evolved! - There seems to be a consensus that the system really took off during the latter part of first president Akaev’s time in power. The old Soviet cadre officials started leaving due to retirement or inability to cope with the new conditions. At the same time came effects of the privatization that Akaev initiated: large amounts of cash circulated and replaced formal rules as a way of structuring power. Moreover, the Akaev regime became more authoritarian and private businesses were often attacked and raided by members of the regime. For many businessmen the only way to protect themselves against the leadership was to go into politics. The parliament, for example, started to be propped up with business executives who used legislative powers to develop their businesses further. Today, you can see that the leadership has been changed, from the old Soviet nomenklatura, to actors like Atambaev and Babanov. They started out as businessmen and went into the biggest business of them all: the state. - Describe your methods, what kind of research did you do? - I did totally some 100 interviews, from 2006 and forward. I spent about one and a half year in the country. I focused on the sectors law enforcement, taxation and politics. This is where you find this aspect of investment the most. Maybe in a place like the Ministry of Culture this is less pronounced. I interviewed policemen, tax officials, political elite, civil servants and also civil society, like journalists and experts. I often had sensitive interviews, it takes time to build trust, had informal meetings. When quoting politicians and experts in the dissertation, I give their names. But everyone else I have anonymised. - What are the consequences of this for society? - First of all, clearly the economy is crippled, when people invest in buying an office instead of investing in productive economic activity. You can compare this with the situation in the south, where the Uzbek minority is practically barred from public offices and instead engages in productive economic activity, building up trade and service infrastructure. Secondly, the state budget suffers when civil servants and politicians use their positions, отбить деньги as its called in Russian, to recapture the money they've invested, and so steal or siphon it in cash, resources or value from the system. [E g, Dr. Engvall writes that formal fees and regulations are often systematically exaggerated, in order to force businesses out of the legal sphere and into paying bribes instead.] Third, the state becomes very short-sighted, since the positions are insecure and change frequently. You have to get rich soon and it is not rational to plan ahead. Four, important state positions are filled with people without merits and very little credentials. There is a lack of competence and motivation. Worse, criminals who have made money enter powerful offices, using them for their own purposes. - In the dissertation, you indicate that programs to battle corruption, such as judicial reform, have instead often intensified it. E g, "twice in five years, Bakiev changed judges on all levels of the court system. As a result, judges did not know how long they would remain in office, and started making money aggressively." Is there any recipe for achieving a normal, well-functioning state in this case? - Well, the anti-corruption programs of the OECD, USAID and ADB fail because they attempt gradual change, working with officials who often themselves bought their positions. Of course they bring some technical improvements, but then officials just adapt the corruption instruments. You have to address this integratedly, on the level of the whole state system. Real political will, and political strength and courage is the key. The systemic corruption is not a cancer in just one place of the body that you can just cut away, it needs to be attacked dramatically. I'm looking at Georgia, this investment market is completely gone there. it's been targeted very wholly there, in all its aspects. (Georgia has other problems with lack of transparency at the top.) My idea is that revolutionary changes are needed in the institutions. And it's possible to do it. - So this is not a cultural thing? - No I don't think so. Of course there's an acceptance for this corruption in an environment where formal institutions function poorly. But it was the same in Georgia, they said that it would never change. And when Kyrgyz people move abroad, out of the system, they stop doing this, they quickly adapt to other state models. - What's your advice to the Kyrgyz people today? - It's true that the parliamentarism has broken presidential power and decentralised influence, but I haven't seen a change in the nature of rule and the purpose of power in the new leadership. And to break out of this system, a strong political will and a strong public mandate is needed. They had a good opportunity in April 2010, but lacked ideological motivation. Otunbayeva maybe tried but she had too weak a mandate. So it's been business as ususal. It is also unfortunate that the young generation that has left the country to graduate abroad often does not come back to the country. It needs a mental change. The state is still a dominant structure in society, so maybe strengthening private actors and civil society to compete with it can also be a way forward. - Your model of the state as an "public authority bazaar" seems to fit many authoritarian, semi-failed states all over the world? 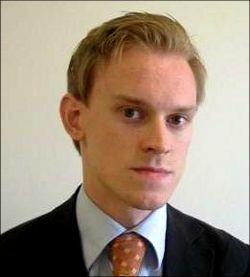 - I do think that the legacy of the Soviet Union, where the state was the all dominant structure in society, may put this region aside from for example countries in Africa where the state is but one competing actor and rebellious society, foreign firms or other states may be just as important sources of corruption. In the post-Soviet region, the importance of the state for opportunities to earn and invest may be less pronounced in countries with more developed conventional economic markets or an abundance of natural resources that individuals can invest money in. Dr. Johan Engvall is based in Uppsala, Sweden. His dissertation, in English, can be downloaded here. Dr. Engvall will now be writing a popular book on the same topic and is planning a field-trip to Kyrgyzstan during the second quarter of 2012.